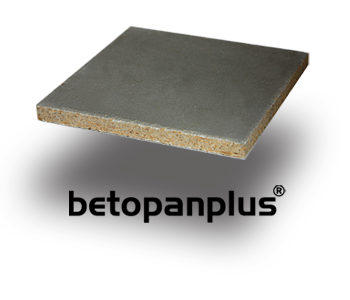 Betopanplus is a construction board, which merges the positive qualities of wood and cement. It provides the necessary solution for the different needs of different parts of buildings. Betopanplus is a mixture of wood, cement and harmless chemical additives, both sides of which are protected with natural minerals. It is a plain board with no pattern. In 2001, Betopanplus was the first Plus product that was manufactured. The first product, Betopan, had two surfaces that were protected with a mixture of non-particle, but natural, minerals and cement. In this way, the board has much less susceptability to relative humidity. It is as resistant to external impacts as a quality concrete, and any paint applicable on a concrete can be applied to it. It is possible to MANUFACTURE boards in other thicknesses and to CUT them in the required widths and lengths. Solid, durable, reinforced cement-bonded particle board. It does not contain any harmful material. It provides excellent thermal and acoustic insulation. It is ideal for prefabricated buildings. It is protected with natural materials on both surfaces. TASONIT boards manufactured in standard or customized sizes are drilled and their edges are finished in the factory in advance, and mounted directly on the surface of the existing wall by means of wall plugs. Insulation material can be mounted under TASONIT modules when necessary. The bearing construction is completed by mounting M profiles are on surfaces by means of guiding elements and wall plugs after mounting the thermal isolation boards. After the placement of appropriate system accessories required by the design, TASONIT boards sized according to projects and the edges of which are finished in the factory are screwed on the construction by leaving the necessary recess spaces by means of guiding elements. The bearing construction is completed by mounting M profiles are on surfaces by means of guiding elements and wall plugs after mounting the thermal isolation boards. After the placement of appropriate system accessories required by the design, TASONIT boards sized according to the design, and the edges of which are finished in the factory are screwed on the BETOPANPLUS strips mounted on the bearing construction for creating recessed joints by leaving the necessary recess spaces by means of guiding elements.